This looks interesting. I wonder how Marvel is going to touch on Storm's history with Vampires? In a perfect world Buffy would come in with her super slayer powers and team up with Storm But I'll settle for Gambit. From my view...I'm not an expert on Marvel Vampires but how much trouble can Storm have with these creatures? Vampires are weak. Only Gambit will get good feats while Storm will be written down. Hopefully, these vampires uses magic. Storm might become a vampire too, since she was already bitten by Dracula. Interesting, I'll be sure to pick this one up. I sincerely hope they DON'T turn Storm into a vampire. It would be so lame. I hate how writers always put Storm down! Please excuse the quality of the words. I don't know what CBR previews are coming to. They are readable...Just a little blurry. Looks really good, GOTS. I really love that sensing dark magic page, I'll definitely get this when it comes out. I'd definitely have one. I'll buy when the graphic novel comes out. The story takes place during a war that's been brewing between San Francisco and vampires. Apparently the armies of Xarus(Son of Dracula) are beginning to build at an alarming rate, which leads Cyclops into making a desperate decision of resurrecting Dracula himself; But in order to do this they would need to get the body of Dracula first. This leads Cyclops into calling in Storm and Gambit for the job, as they are the best of the best in thievery and Storm has had plenty of history with Dracula(which was noted several times in the issue.) It was a delicate situation, Cerebra and teleportation was not a current option for them and they also had no idea what their defenses were or where Dracula's body was located. Therefore, Storm and Gambit were completely on their own and it was up to them to save the day. After Blade discovered the location was on a Greek island, Storm and Gambit were on their way for a great adventure. On their way there, Storm instantly senses dark magic conflicting with the weather patterns and identifies that a field was being generated to block out Cerebra and Teleporters. At that moment, Storm is alerted telepathically by someone, who had not yet been identified, that the Vampires were aware of her presence and that she should exit the jet immediately. Moments later, after taking the advice of the stranger, the jet was sure enough destroyed. They were then telepathically led to enter a cave where Storm made note to Gambit that Xavier had been giving her excellent coping exercises, which allowed her to enter the small space with little to no trouble at all. Storm also used her powers to raise the air-water saturation around them to mask their scents from the Vampires, but doing so caused her extreme discomfort due to the magically corrupted weather patterns there, which was fighting to resist her control. She wore a utility pack on her back that was equip with several different weapons. All specifically for dealing with vampires: A sword, a knife, and several wooden spears. Storm and Gambit were then ambushed, where Storm attempted to use her powers. They however fell out of her control and became very violent in it's manifestations. Storm immediately stopped using her powers and relied on her h2h combat skills. Using her katana with expertise, Storm used it several times to cut down vampires mercilessly throughout the issue. After the ambush was thwarted, a vampire name Janus arrived on the scene, notably aware of who Storm was and is the first son of Dracula. He was the person who had been communicating with her telepathically, and was attempting to join her in freeing his father. After having a conversation with him, Storm was convinced that she would allow Janus to join her and Gambit. They interrogated one of the vampires in the ambush and was sent to a temple where Dracula's body had been buried. Before Storm could retrieve the body she was ambushed once more and taken down a crevice where she was attacked by hoards of vampires. Using her h2h skills once more. she defeated all of the vampires in question and discovered where the field was being generated. The field was being generated by several vampires in hibernation. However, the vampires were being fed by several innocent people who's blood was being fed to the vampire via a cord. 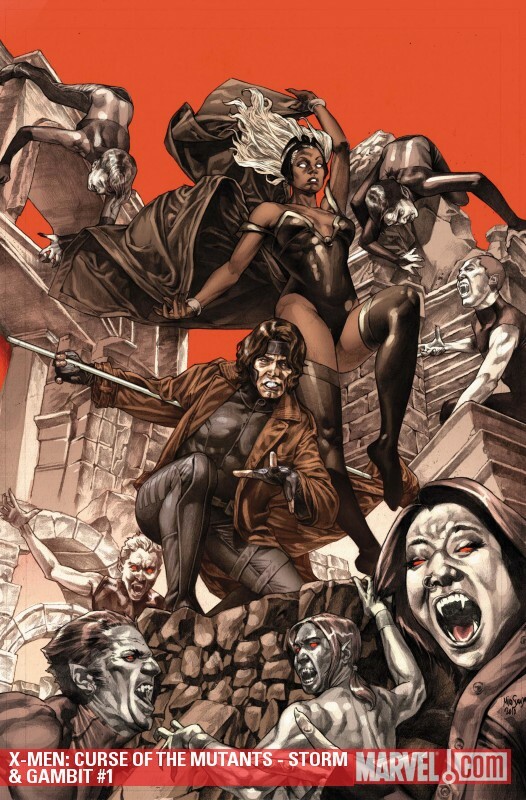 Janus explained to Storm that there was no way of freeing them from the vampires without killing them; therefore, Storm was presented with the ultimate decision of killing the innocent victims along with the vampire in order to shut down the generated field, so that the X-men could teleport in and help with the ambush against Gambit and Janus, or wait and discover a way to free the innocents without killing them. After sharing a tender moment with one of the innocents, Storm expresses to her with compassion that she does not know how to save her and unleashes her powers to destroy everything in the room. The field drops and the X-men come in to finish the job. Arriving back to Gambit, Storm expresses extreme concern after killing those innocents in order to complete their mission, and described that it may be too much to bare if she crossed that line again. The issue was simply amazing and Storm was written exceptionally well. Everything about Storm and the entire issue was handled well; and the art was spectacular in many panels. From the bloody combat to the tender moments with the innocent, to the chemistry between the characters, the writers simply did an amazing job with it. It only saddens me that there is so big a gap between issues where she is written correctly. I can't do anything but give this comic a 10. Simply a great read. Every Storm fan should read it and get their fix, because it'll be awhile before we get anything like this again.